No problem choosing the photo of the day. 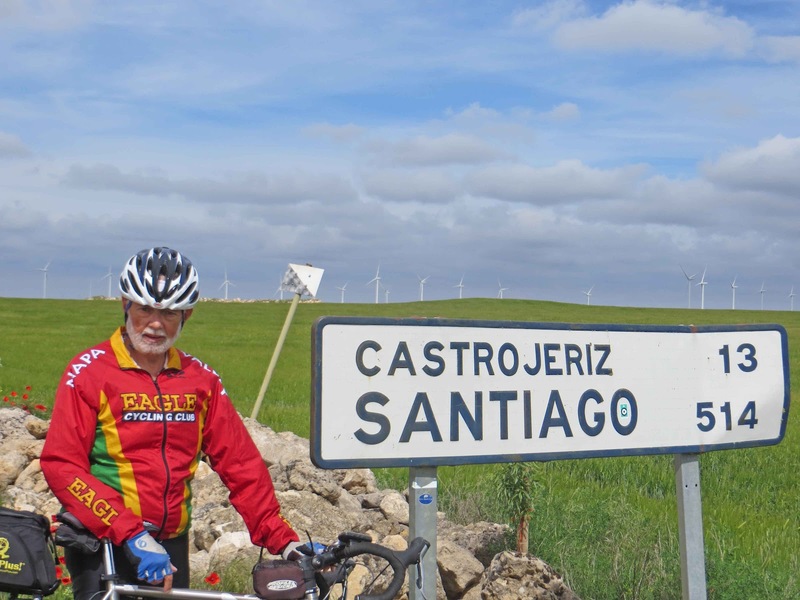 Bob stopped to take a "green door" break and found that Spain has thought of everything for the pilgrim traveling the Camino! You will notice the wind turbines in the background (Sure you will.). We have seen them everywhere in Spain, and today was proof that they have been a very great investment for the people of Spain. 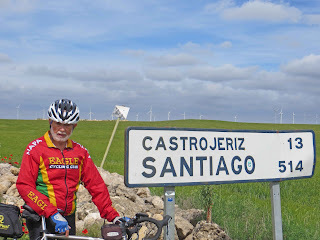 We had strong headwinds all day, except for the last fifteen miles or so when we had strong side winds. The ride was almost exactly 100 km (62 miles) with about 3200 feet of climbing. Fortunately the climbs were not steep at all, but the wind added to the level of difficulty. Nonetheless, we all finished together in reasonably good time. Our hotel is a converted Benedictine monastery that dates back at least to 948 A.D.! It is very well appointed and has some beautiful commons rooms, such as the dining room where we had dinner tonight. Philipp, one of our guides gave us an overview of the history and architecture of the monastery and the church that is here. We left the province of Burgos today and entered Palencia (not to be confused with Valencia, an entirely different area. For a good part of the day, our route was the same as, or parallel to, or criss-crossed the route used by the hiking pilgrims, so we saw many of them. We also saw our first pilgrims doing the Camino on horseback. Many of the peregrinos do not stay in nice hotels as we are doing, but in "alburgues," which are simple and relatively inexpensive shelters. Because of the large number of people doing the Camino, there is a priority for obtaining one of the available spaces in these shelters -- first the walkers, second the bicyclists, and third those on horseback. (In many cases these are not feasible for those with horses because of the need to shelter and feed the horse.) Many of the shelters fill up early in the afternoon, so we see far more hikers in the morning. We stopped twice today -- once for coffee in the morning at Hontanas. While there we saw an interesting phenomenon (which we also saw a couple of other places). A vendor of a certain type of food -- a butcher, or a vegetable seller, or a person selling bread and eggs, will enter town in his small truck, with his horn blaring to announce his arrival. Because these villages are too small to support a full time grocer, seller of fruits and vegetables, or bakery, people will come out and buy from the mobile seller. So, in Hontanas, for example, we saw a woman come out with her egg carton and buy 10 eggs, the owner of our cafe came out to get butter, and another cafe owner came with two large paper bags to lay in his store of bread. The second stop was originally planned as a very quick "see if we can get our passports stamped" visit, but we ended up buying a few sandwiches and tarrying a while before heading back into the wind. Fortunately we had good cloud cover all day, and the temperature was actually quite cool. I did not take my jacket off until 1 pm -- it was simply too cold (especially with the wind) before that. Tomorrow's ride is another long one -- 110 kilometers -- that will take us to Leon. 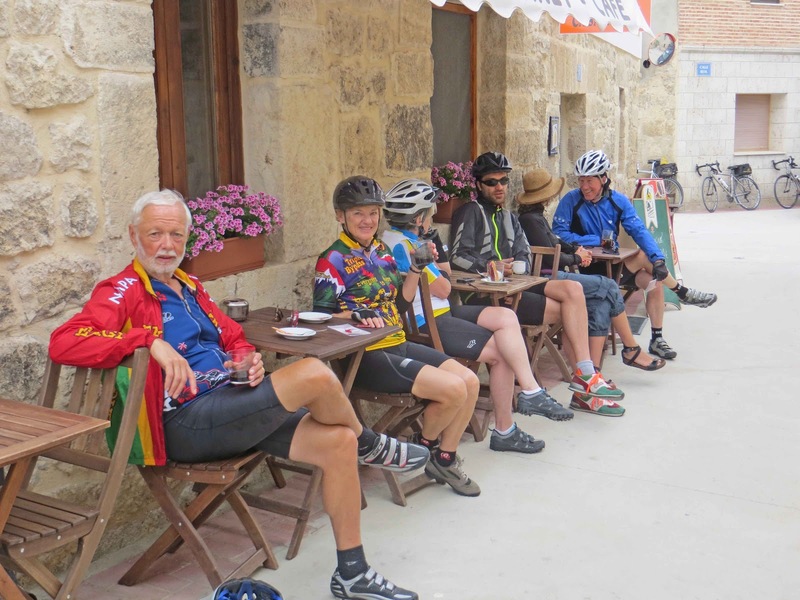 We will have our only rest day after arriving there, and will also pick up and additional four riders who will be with us for the remainder of the Camino.